MANILA, Philippines — (Updated April 26) The November 2017 Philippine Bar Exam results are officially released online after the special en banc session TODAY, April 26, 2018. Out of 6,750 law graduates who have completed the tests on the four Sundays of November 2017 (5, 12, 19 and 26), the full list of passers and topnotchers (top 10) who got at least 75 percent average grade are announced by the Supreme Court (SC). UPDATE: A total of 1,724 out of 6,748 (25.55%) successfully hurdled the bar exam. Passing grade at 75%! "#BAR2017 results will be released today after a special en Banc session. AJ Lucas P. Bersamin will officially announce the results after the session. List of successful examinees will be uploaded to the SC website and flashed on a monitor at the SC quadrangle.," SC confirmed. For the 116th bar exam, the SC Public Information Office (PIO) said: "7,227 were admitted to take but after first Sunday, only 6,759 remained and on the last two Sundays, there are only 6,750 examinees (still higher than 2016)." The statistics showed that 479 of the 7,227 admitted candidates did not show up to complete the examinations. As a protocol, takers who did not proceed on succeeding exams are not required to explain their absence. In addition, SC has no way of knowing if the examinees fell ill or were simply overwhelmed by fear of the grueling tests. 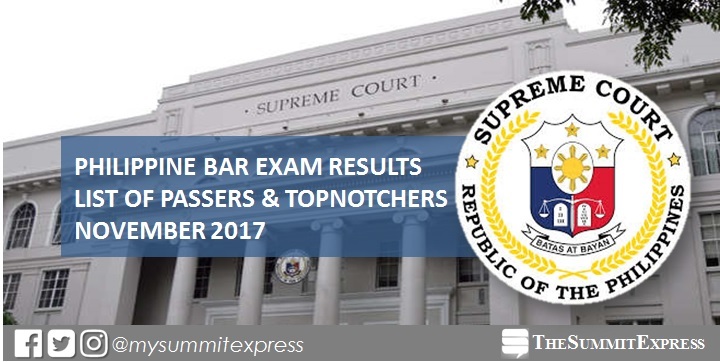 The 2017 bar exam was headed by Committee Chairman Associate Justice Lucas Bersamin and the eight (8) examiners for each bar subjects. The examinable subjects are: Political Law and Public International Law (15%), Labor and Social Legislation (10%), Civil Law (15%), Taxation (10%), Mercantile Law (15%), Criminal Law (10%), Remedial Law (20%) and Legal and Judicial Ethics (5%). Examinees were tasked to answer open-ended questions in long hand. Those questions, carefully selected by the committee, are formulated to test analytical ability, facility in expression in terms of written argument, comprehension of basic principles of law, and grasp of jurisprudence. While a bar examinee is “deemed to have passed his examinations successfully if he/she has obtained a general average of 75%,” the SC en banc has always retained for itself (based on its authority to amend the Rules) the discretion to make adjustments, as it did in the 2012, 2013 and 2014 Bar Examinations to lower the bar exam passing percentage. In 2012, the Bar exam committee lowered the passing average to as low as 70%. In 2013 and 2014, the highest court lowered the passing grade to 73% in view of the structure of the results, the difficulty the candidates encountered with the MCQ portion of the exam, and in light of past precedents. Meanwhile, the standard passing grade of 75% was kept for the 2015 and 2016 examinations. Section 14, Rule 138 of Revised Rule of Court added that there should be no grade falling below 50% in any bar subject. The results of the 2015 and 2016 were both released on the first week of May the following year (specifically both May 3). The Bar Examiners committee manually checked the test papers which caused the long waiting period of about five (5) months. The Office of the Bar Confidant (OBC) is tasked to release the 2017 Official List of Successful Bar Examinees, expected anytime in April to May 2018. Traditionally, the full list of successful bar examinees will be flashed on a widescreen at the Supreme Court front yard and simultaneously be viewed at the official website of the high court. Prior to the official release of list of passers and topnotchers, reliable sources give some hints on the possible date of release of the results. Specifically, the Supreme Court and the personnel related to the administration of the bar exam are sharing information of the special en banc leading to the release of results mid-day of the schedule. Same with the previous examinations, The Summit Express will provide immediate and live updates on this page and our social media accounts in time for the announcement of results. December 10, 2017 Update: Due to the allegations that the 2017 bar exam questions were lifted from the past years exams, Supreme Court (SC) Associate Justice Marvic Leonen challenged the netizen who claims the charge to be more specific because if it's not true will also be a serious offense. Which questions and allegedly copied from which bar examinations. Please specify. This is a serious charge. If not true, it is also a serious offense to accuse. April 12, 2018 Update: Bar exam results are out on April 26 (Thursday). April 25, 2018 Update: The 2017 Bar exam results will be released around 11 a.m. to 1:00 p.m. tomorrow, April 26. Good luck, aspiring lawyers! April 26, 2018 Update: Bar exam results are out TODAY! UPDATE: Bersamin said the oath-taking of the bar exam passers will be on June 1 at the Philippine International Convention Center (PICC) in Pasay City. The Philippine bar examinations, dubbed as the most prestigious professional licensure exam in the country for aspiring lawyers, is the only professional exam not handled by the Professional Regulation Commission (PRC). It is exclusively supervised by the Supreme Court. The SC conducts the Bar examinations pursuant to Article VIII, Section 5 of the Constitution which provides that it shall have the power to promulgate rules governing the admission to the practice of law. Some Filipino lawyers say the bar exam is tough because it is centralized on eight bar subjects, with the expected annual passing rate of 20% to 30%. Special en banc session for the 'decoding of bar exam results' is being done morning prior to the release of results. Decoding is the process where the SC orders the OBC to open the sealed envelopes with the names of the candidates who passed the exams. From 2000 to 2006, the Bar exam passing rate exceeds 30% three times (in 2001, 2004, and 2006). After that, the passing rates saw a decline, with the rate going as low as 20.26% in 2010. However, the following year, in 2011, the passing rate suddenly increased to more than 30 percent (31.95%). This was the year the SC introduced multiple-choice questions (MCQ) in the exams. For two years, results for MCQs weighed more (60 percent) than the results for essay questions (40 percent). But unlike in the 2011 results, the 2012 passing rate plummeted to a 12-year low of 17.76%. The following year, in 2013, the high court decided to change the Bar exam rules anew. This time, essay questions were made to weigh more (80 percent) than the MCQ (20 percent). That year, the passing rate recovered (22.18) but still far from the 30-percent mark in the early 2000s. The 2014 exam also resulted to a low passing rate of 18.82% while a big jump was saw in 2015 having 26.21% , the the sixth highest since 2001 which had a 32.89 percent. Last year, a record-breaking 59.06% passing rate was hit (3,747 out of 6,344 examinees). This was a historic high for at least 30 years. Reports said that 2016 Bar Chairman Justice Presbitero Velasco Jr was more "reasonable" as "points were given to answers, even if the positions taken may not exactly be the right answer." In an unprecedented turnout, all topnotchers in the in the last year's bar exam came from the provincial law schools, dominating the usual top performing NCR-based schools. University of San Carlos' Karen Mae Calam aced the bar with a rating of 89.05%. “Each bar examination must be considered unique in itself when we look at the comparative statistics across the years. Unlike other licensure examinations which employ a standard set of questions and the same set of examiners across a period of time, the bar examinations for each year is practically a new exam because the composition of the Committee differs—from the Chair, who has absolute and sole discretion to choose the questions to be asked, to the eight examiners, who are the ones who correct the notebooks."